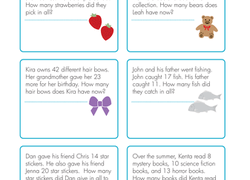 Give your third grader a leg up on their addition skills with these worksheets that will take them beyond basic addition and subtraction concepts and into the exciting and sometimes tricky world of multi-step word problems, multi-digit addition with regrouping, and decimal addition. Our worksheets are the perfect mix of fun and challenging that will keep your child engaged and learning! 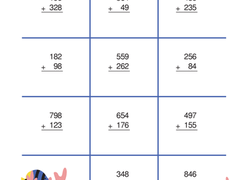 Packed with addition problems requiring regrouping, this worksheet is a perfect way to practise addition with carrying. Practise makes perfect! 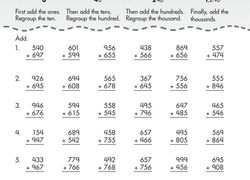 Use this worksheet for a quick practise session in double-digit addition and subtraction for your 1st grader. Use this Arctic-themed resource with your students to practise multi-step word problems with mixed operations. Addition Word Problems: Add It Up! Kids use details from the word problems on this year four maths worksheet to construct and solve addition problems with two or three two-digit addends. 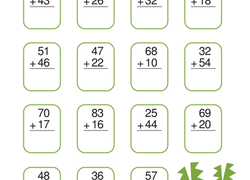 This addition and subtraction exercise is designed to assess your students' maths skills at the beginning of year four. Put a little silliness into maths practise with these April Fools' Day word problems! Introduce your child to managing their personal finances by tracking Dori's debits and credits for this month.